Published: May 31, 2004 to ? Towards the end of the 19th century, Allen Walker officially joins the organization of Exorcists that destroy the beings known as Akuma—mechanic weapons made by the Millennium Earl with the suffering souls of the dead. Allen has both a cursed eye and an anti-Akuma weapon as an arm, bearing the power of "Innocence," a gift given to him as an apostle of God. Allen, along with his fellow Exorcists must put a stop to the Millennium Earl's ultimate plot that could lead to the destruction of the world and all who live on it. Originally serialized in Shounen Jump between May 2004 and April 2009 (2004 #27~2009 #22+23), but after a hand injury of Hoshino Katsura, moved to Jump SQ on November 4, 2009 (2009-12) and continued irregularly until January 4, 2013 (2013-02), after which was put on indefinite hiatus that continued for more than two years. Serialization restarted in quarterly magazine Jump SQ.Crown Vol.1 (2015/7). The manga has been published in English by VIZ Media under the Shonen Jump Advanced imprint since May 2, 2006 and in 3-in-1 omnibus editions since July 2, 2013. It has been also published in Spanish, first the first 23 volumes by Glénat until August 2012, when Shueisha broke the contract with Glénat, and then by Ivrea since July 2013, re-editing the first 23 volumes and simultaneously publishing new volumes; and in Italian by Panini Comics under the Planet Manga imprint since July 20, 2006. I first got into D. Grayman out of curiosity because a lot of my friends were reading it and gushing about it. I expected it to be just another basic shonen title with little to captivate me, but I quickly found out that I was wrong. The first volume hooked me like none other, and I found myself with an obsession warranting catching up to the Japanese release on scans. Anyone that knows me (which isn't many of you) knows that I hate reading scans for many reasons, but it was a necessity for D. Grayman because I couldn't wait for the volumes to come out, though I still buy them when they do. While it's not the most unique storyline I've ever seen, so much just feels fresh and different, especially for a shonen title. With no tournaments to be seen, the darker edge that the series has, and its perfect mix of humor, drama, and action, D. Grayman is a breath of fresh air into the genre. I adore the setting, me being in love with the selected time period, and the vibe one gets from the series is really enjoyable, especially early on. The Rewinding City chapters had to be some of the best chapters in manga ever. The artwork stunned me from the beginning. It's some of the most detailed manga artwork I've seen. I love the character designs, clothing, buildings...everything. The Rewinding City really did look like a small German town, and the Black Order's HQ is a treat to look at. Some characters have designs that aren't only gorgeous, but also unique as well. An example of that is Miranda Lotto. She doesn't look like your typical anime girl in any way, especially her eyes and hair, but is still lovely. I have yet to find a character that I truly dislike in this series, save some of the villains. They are all interesting to learn about and see interacting with each other, including minor characters like Komui, Miranda, and Reever. I'll admit that Lenalee can get irksome at times, but the others more than make up for that. All I can really say here is that this has to be my favorite of any manga I've ever read. I've given it an overall 10, and you should all go out and buy volume 1. Another misundersanding here, but why is this manga not reviewed?! Second review for manga! Here it goes! Story: There are stories where we can skim over a few chapters and still understand what's going on; there are stories where we can skim over a few volumes and still get what is happening. D.Gray-Man doesn't fall into either category. If you miss even two- three pannels at first, if that subject rises up a again, you will be lost. Everything is thickly intervoven; you won't find mentions of something just random, and you won't find side-plots ending up with a dead end (in turn with you wasting your time). For some it might be a letdown, but if you really want a manga with style and more than one plot that COUNTS, this is the ultimate top! A 10. Art: Beautiful images with detailed expressions and actions, the only thing that puts me off is that there can be times when the toning can be overkill ( where even on zoom in on scans you can't see what is going on) Other than that, for a shonen manga, this is probably the highest quality art that you can get. Without a fault that I can name, I give it a 10. Character:Probabaly the strongest point of the manga, as many old time readers will agree, the character development is superb! All of the characters have a story that, first of all, is not told in one huge chunk of flashbacks as we have so commonly seen ( My first pleasant surprise). Instead, the details are told little by little in situation that really require these explanations, in turn making the story more interesting. No one has the same character and we often see two sides of one character ( as they fight themselves in decisions or in some cases, physically). You will never grow bored of their adventures and soon you will see that they hold something that you can somehow realate to. A 10. Enjoyment: I get so much joy from sitting down and reading a chapter of this manga. No visable fillers, no long conversations unless absolutely necessary, no random character stories, I find that the manga's whole beauty lies in that. After reading a chapter, it leaves you at a cliffhanger but at the same time, you are satisfied if only for the moment; you feel as if you are given a very good chapter with information ( unlike some manga where you read a chapter and dub it as totaly worthless as you feel you are back where you started). Really, I get a full 10 out of it! Overall: If you are really in need of something supernatural, shonen-y and full of adventure ( even a little romance!) you must put this on your to-read list. A buy worthy both of money and time, I thing that this brings definitely a certain amount of happiness when reading. If you hve the chance, please give it a try :] I hope you won't be disappointed! Thank you all for reading my review! I hope it was helpful to all of you! There is something strangely compelling about D.Gray-man. Perhaps it is the cast of characters that grows, not one obviously faster than the others, but together, or perhaps it is the emotional rollercoaster the mangaka has managed to take the readers on. There is something about D.Gray-man that makes you think, that makes you wonder, and that makes you shocked and surprised at the littlest of things. The main character is one that is perhaps not easily identified with, but easily understood. His emotions, his feelings, his goals and his dreams, all these are splayed out in front of the reader. Perhaps not clearly, perhaps not in-your-face, but these themes come subtly across, and whilst these themes might be, like most shonen mangas, slightly clichéd and all too hopeful, D.Gray-man manages to bring them across such that they are believable. D.Gray-man lets you empathize with the characters, there are never too many of them, and there are never any that you can really hate. Most of the villains [with the exception of the main one who epitomizes pure evil] have this inherent innocence, pardon the pun, to them, and at the same time there is something not quite pure in each and every one of the heroes. D.Gray-man takes the common perception of good and evil, and while it does not quite turn this perception on its head, it makes the reader start to question, start to think, and start to worry. Oh yes, the main villain is delectably evil and will stay so, but at the same time, there is this almost childish air to him that can easily be identified with. And yes, most definitely, the main character is fighting to defeat this main villain, but in between them lies this grey area, this killing field where hatred for the other side abounds. And yet, within this hatred lies a certain level of understanding. The characters, they understand each other, they fight each other, and they grow in many many more ways than just power. One could perhaps say that in D.Gray-man, the lines of good and evil, of friend and foe, are sometimes a little blurred. 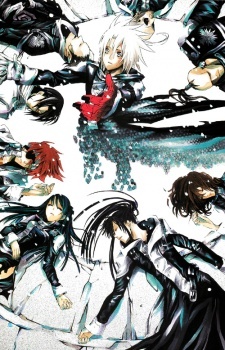 There is always something rather, perhaps not disturbing, but profound within the themes and characters of D.Gray-man. D.Gray-man makes you think, and that is much much more than I can say for most other manga. there is something about this series that i find very captivating. before i started reading/watching this series i remember one of my online friends mention it every now and then and she seemed to really like it. even so there was still something that kept me from trying it and i fully regret that now because there is not much about this series that i can't appreciate. ok let's get down to business now. let's start with a story. when i first heard the basic story of humans vs. demons what i thought was "this doesn't seem like a very original story and i might get bored quickly" but boy was i wrong! while it might not have the most original concept of good vs. evil there are many little quirks and different sides to it that give it a very original spin and i am far from ever getting bored. i think one of the strongest points of the story is the perfect balance of comedy, horror, drama, fighting, and a hint of romance to top it all off. one of the only things that might irk me a little is the fact that the main characters always seem to be in some of the most helpless situations, but then again that keeps away lame filler chapters and definitely keeps the story going. this story put me through an emotional rollercoaster! i laughed, i cried, i felt angry, and i fangirled. the art is some of the best art i've seen in shonen manga. the character design catches the feel of the character's traits and it captures emotions so that i can practically feel it coming off of the page and i feel like i'm practically jumping right into the story which is obviously a major plus. the action is intense, the emotions are raw, and the art definitely adds to all that. no doubt, the characters are the best you will find in any story, manga and otherwise. the characters are definitely far from one-dimensional, especially in the main character, Allen Walker. if you were to see Allen at the beginning when he seems like the most innocent and adorable person in world, and then skip towards the chapters in the hundreds you would be amazed at the development. not only in Allen, but all the characters. none of the characters are completely good or completely evil either and the ugly side is shown in each character which definitely adds to the series. the enjoyment of this series is the highest enjoyment i have had for any series in a while. i seriously can't stop reading this, i have to always see what happens next. How long will this series will take to end? The power of Innocence used in D.Gray-man is both the primary weapon in the war between good and evil, and also the source of some of humanity's most primitive urges. Find out more about the origin and types of the only weapon against the Akuma in the following article.